How many times have you wondered if something could be done to protect the wild animals we see injured or dead on the roads? The online platform of “PARATIRO” is an initiative aiming to implement a national, reliable system for recording and cataloguing the causes of injury or death of wild animals caused by human intervention. By applying Citizen Science, it gives us all the opportunity to contribute to the protection of wild life. 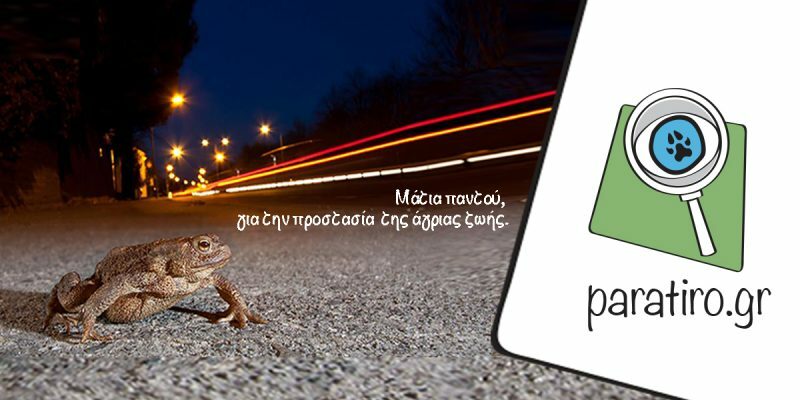 By visiting the platform at paratiro.gr or by downloading the application (here or here), we can immediately record the incident each time we locate a dead or injured animal. The information collected is grouped based on the species of the animal, the cause of injury/deaeth and the area it was found. The “PARATIRO” research team processes this data and uses it to extract important conclusions about the threats facing wild life because of human activities, and propose specific measures and focused action that could reduce or even eliminate the factors responsible for the mortality of animals on a local or national level. Watch, on this video , how the PARATIRO platform can help wild life. Come to the Interactive Exhibition of Thessaly Science Festival to meet us up close and find out more about the code of conduct in nature and how we can all protect the biodiversity of our environment! PARATIRO is an initiative of the Society for the Protection and Care of Wild Life-ANIMA implemented in cooperation with the educational non-for-profit organization “SciCo-Science Communication” and funded by the Green Fund in the context of “Natural Environment & innovative actions” Funding Program. The Thessaly Science Festival is organized by the educational organization “Science Communication – SciCo”, the University of Thessaly, the Mayoralty of Culture and Science of Municipality of Larisa, in collaboration with academic, research and educational institutes.